It's Spring & D1 Nation Baseball and Softball Are Back! Following our surge in basketball and volleyball the D1 Nation is steamrolling along and becoming a multi sport site that delivers local and regional news along with it's long established national presence. The purpose is to serve under-recruited athletes in assisting them with being able to continue their chosen sport on into college with some financial relief. The catalyst for this expansion is the addition of the leadership of volleyball under Coach Joe Flores and now the addition of Coach Keith Balderaz who will spearhead baseball and softball. I'm happy to welcome Keith and his wife, Lindsey along with his two children Kash and Fallon. 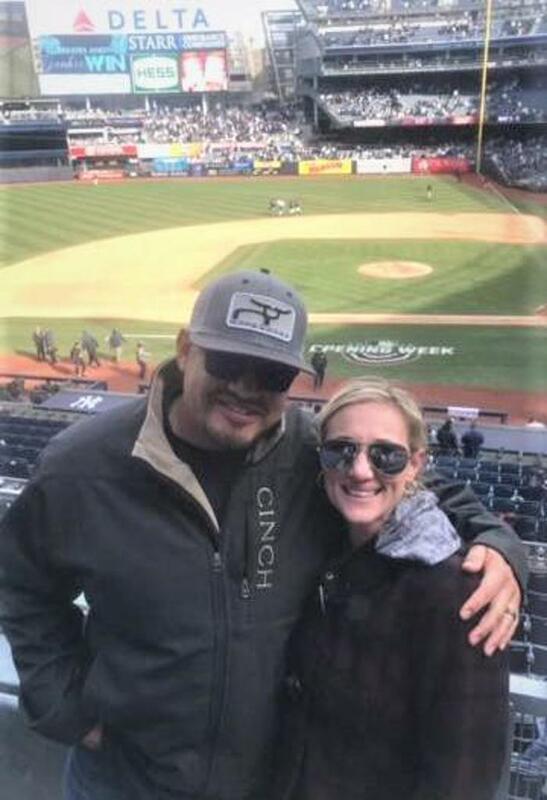 While we can't promise to have you playing at Yankee Stadium (where Coach Balderaz visited this March ABOVE), we can promise to do our best to improve your chances of playing the game you love on into high school and college. Keith was born and raised in a small West Texas town, Monahans, and still lives a stones throw away in Midland, Texas. While playing high school baseball he was awarded numerous accolades including, several all district honors, regional teams and culminating in All State honors as a senior. Coach Balderaz chose to compete in the Lone Star Conference, receiving a scholarship offer from Division II Eastern New Mexico University. He still holds several records for the school including all time saves leader in a season and career. He also has the distinction of the lowest era in a season. After graduating from college with a Bachelors degree in Sports Communication he moved to Houston and worked for TPX BASEBALL as a pitching and hitting instructor. He helped several young men move on to play at the next level including players at Sam Houston State, Tyler JC, Angelina JC to name a few. After two years as an instructor he received an offer to begin a career in the oil and gas industry which brought him back to West Texas. He applied his knowledge and experience as a baseball instructor to start a TPX organization in Midland which successfully orgnized 3 different teams, ages 10-13. Once again he was able to help young men, through private lessons and as their coach, prepare for the next level. He had players from his program commit to play college baseball including alumni at Oklahoma State, Lubbock Christian, Texas-Permian Basin and Baylor. Keith is passionate about baseball and looks forward to a new opportunity to support and guide young athletes to the next level. His expertise along with Coach Flores and D1 Nation Founder, Max Ivany will be a winning combination.